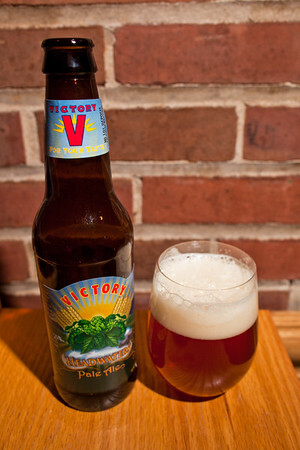 January 20, 2012 - Victory Headwaters Pale Ale. Victory Brewing Company of Downingtown Pennsylvania is, in my opinion, one of the best breweries in the country. Their beers are always well crafted, flavorful and very fresh. The subject of today's picture is a bottle of Victory's Headwaters Pale Ale. This is a fairly recent addition to their lineup - hoppy and refreshing. At 5.1% ABV it falls into what I'd consider a sessionable beer - you can have more than one without needing to consider dialysis. So many beers these days have adopted the "imperial" moniker and thrown in more of everything. This isn't one of those beers, rather, just a well made drinkable pale ale. Would that more breweries could concentrate on making quality styles, versus trying to outdo the other guy. Cheers to Victory! Photo details: Canon 5dII, Zeiss 28mm f/2.0 ZE lens, hand-held. ISO 100, 1/60th second at f/7.1. Used a canon 430exII flash off to camera right, gelled with 1/4 CTO, triggered with an ST-E2. Retouched slightly in Lightroom.